October 10, 2006 – Every night we hold our breath, peering out into the dark where some tote flashlights and rocket flares, and some cradle army weapons. Every day that goes by in Oaxaca includes a jostle for position. October 6, 2006 – Nancy Davies writes: The organizations that constitute the Asamblea Popular de los Pueblos de Oaxaca (APPO) announced this Thursday, October 5th, the creation of a constituent congress of the Asamblea Estatal de los Pueblos de Oaxaca (AEPO), a state assembly, in November, to advance an organization with structure, principles, programs, regulations and stable directing committees so the movement will be ready to govern when Ulises resigns. 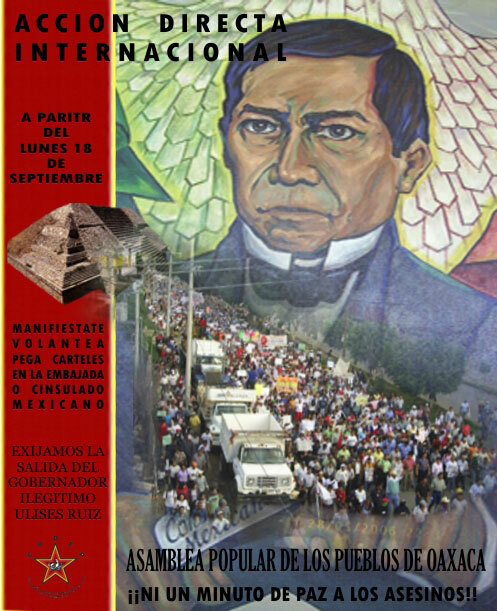 Chilpancingo, Guerrero, October 1, 2006: This weekend, at least 30 trade unions and social organizations formed the Popular Assembly of the Peoples of Guerrero (APPG in its Spanish initials), whose members announced mobilizations set for this coming Monday. The director of the Guerrero Education Workers State Coordinating Committee (CETEG), Felix Moreno Peralta, announced that the APPG will demand that Gov. Zeferino Torreblanca Galindo resolve various requests, including the dismissal of the Secretary of Education, Jose Luis Gonzalez de la Vega Otero, as well as the creation of 618 positions for graduates of teacher training colleges. The APPG also requests the construction and remodeling of education infrastructure, mainly in the indigenous zones of la Montaña. Furthermore, the APPG will take up social and agricultural demands. The English translation of an important document. Starting September 18th. Protest at the closest Mexican Consulate or Embassy. We demand the exit of the illegitimate Governor Ulises Ruiz. Not one minute of peace for the assassins.